Sometimes when hardships come into our lives, we may think it is because we are doing something wrong. But sometimes those calamities come because of our obedience, not our disobedience. The truth is storms of trouble come to all of us at one time or another. 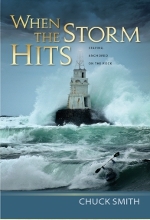 In the book “When the Storm Hits”, Pastor Chuck Smith brings encouragement to anyone struggling with life’s burdens. We love those green pastures and still waters. But we are not really excited about a valley. We love to follow the Lord when things are going the way we want them to go. But when we come across a rough patch, we put on the brakes. We don’t want to go through that hardship. God may not always deliver us from the storms of life, but He is always faithful to be with us as we go through them. There are things we learn in hardships and trials that we don’t learn anywhere else. Where there are no trials in life, there are no triumphs. God has His purposes in the storms. And just as Jesus was with His disciples, He will be with us, too. This book is a great read and I believe it will restore hope and peace to the weariest of believers! Tagged Book, Chuck Smith, Help, Storm, Trial.